For Better - Or What? 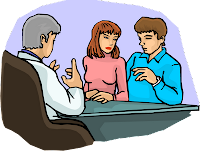 : Have You Tried Couples Counseling? Have You Tried Couples Counseling? Some people think that couples therapy or relationship counseling is a last resort for a failing marriage, while others consider it a good way to learn communication skills and resolve various problems before they become too serious. Many people report that counseling improved their marriages, even saved them from divorce. Others say that it was a waste of time. I'd like to know what my readers have to say about this. I have put together a short, anonymous survey to collect some basic information about the kind of counseling couples may have undergone and the results they obtained. The survey will be open until September 17. I'll publish the results on this blog. Please help me out by answering a few quick questions. Your participation is completely anonymous. Click here to take the couples counseling survey now. Follow-up: The survey has been completed. You can view the results here. When I hear people say that counseling was a waste of time I think they probably had the wrong counselor or that they didn't really give it a sincere try. Marriage counseling may not solve all problems, but having a professional who can look at the situation objectively can really help people change what they are doing for the better. Completed the survey :) We went to couples counseling on and off for a couple of years and it definitely helped, mostly in helping us to communicate more effectively and define our 'roles' in our marriage. With that said, I often think of counseling as a last resort, i.e when the communication has broken down really badly between the couple and/or the relationship is just in a really bad place. It's one of those things that I wouldn't necessarily persuade a couple to go for(especially with the costs involved) but nor would I dissuade them either.